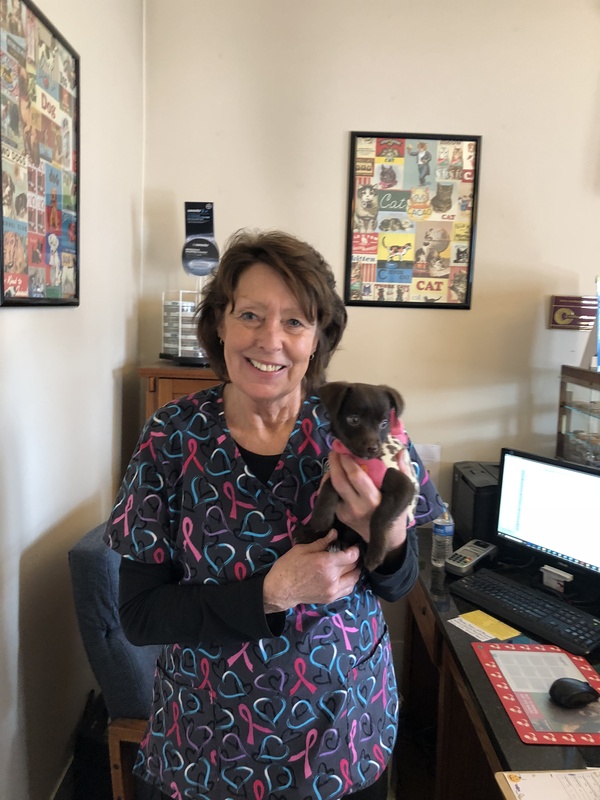 I am Dr. Bryant Morton and I am fortunate to be a veterinarian and co-owner, with my wife Dr. Wendy Wade Morton, of Lynchburg Veterinary Hospital. I was born in Auburn, Al to two loving Christian parents and grew up with my younger brother in Apex,NC. After finishing grade school in Apex, I received a degree in Animal Science from North Carolina State University in 1990. I returned to Alabama to attend veterinary school at Tuskeegee University School of Veterinary Medicine and graduated in 1995. It was in the Summer of my second and third year of veterinary school that I married the love of my life Wendy in 1993. Wendy and I moved back to North Carolina after I graduated from Tuskegee and I worked for a mixed animal practice in Lumberton, NC during my first year out of vet school. Wanting to work for ourselves and make our own business decisions, Wendy and I opened a mixed animal practice in Elizabethtown, NC. This hospital became our life. 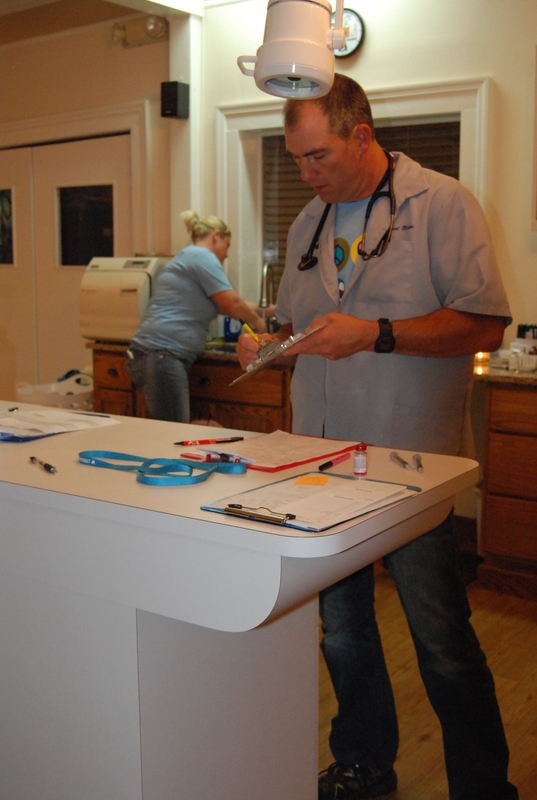 We worked incessantly and built a thriving practice in one of the poorest counties in North Carolina, that met many desperate needs for high quality veterinary medicine with sincere compassion and personal caring. We are proud that this hospital is still in operation today and just as successful as the day we sold it to a veterinarian and his wife from Long Island, NY in 2006. Most people were confused as to why we chose to sell our practice when it was still growing and extremely successful... and seemed to be the perfect future for two veterinarians who had developed it from just a dream and a remodeled horse barn. One year after opening our practice Wendy developed breast cancer and it was a real eye opener for both of us. We were told by doctors that the chances of us having children were extremely slim. Fortunately for us God had other plans and we were blessed with two boys; Bart in 2002 and Alex in 2005. Realizing that we really needed to slow down and concentrate more on enjoying life than working our way through it, we sold our first practice and moved to Shelbyville, TN in the fall of 2006. Wendy and I have raised Spotted Saddle Horses and Tennessee Walking Horses since the late 90's and the love for these animals was what introduced us to the middle Tennessee region. The more we visited this area the more we loved it and the people that were a part of it. We found our home and dream farm in Flat Creek and hope to live here for the rest of our lives. After taking about six months off from veterinary medicine, I started doing fill-in relief veterinary work while Wendy continued to developed our farm and raise our boys. I continued to pursue a career as a relief veterinarian for 5-6 years and though the job was enjoyable to me, there was just something missing. As a veterinarian you obviously have to love animals and trust me, I love them as much, if not more, than most anybody you will ever meet. But with those animals come people. Owners. Caregivers. Animal parents. Whatever you choose to call yourselves. And that is what I enjoy most about veterinary medicine. Meeting new people and establishing relationships with people based around the love of their pets. Our own clients coming to our hospital for our services; that's what I missed most. And that's what brought us here to Lynchburg. How we actually picked Lynchburg as the home for our second hospital was another story. I had just lost both of my parents in 2012 and felt that if there was ever a time to pursue ownership again this was it. I drove through Lynchburg weekly on my way to other jobs and Wendy and I brought our children and out-of-town guests to this charming town frequently. I loved this town but my biggest concerns were the demographics. I kept thinking "It's a very small town and there are several other veterinary hospitals within 20 miles in any direction you turn. Many of these practices I have worked in." Then we just couldn't seem to find the right building. Things looked like it just wasn't meant to be. Then one day on my way home from working in a practice in Giles County I looked in the rear view mirror as I entered the Lynchburg city limits to make sure no one was behind me. I slowed down to about 15mph and asked God to show me today where our new hospital would be. I knew that if I made it to the other side of town and He didn't show me anything today this was not the right thing to do. As I approached the square I was looking to the right examining every house and building hoping for one last possibility and that's when something made me turn my head to the left. I saw an old white building that I had never paid attention to before. It had parking on both sides of it and sat on a rise almost overlooking everything around it. It was surrounded by trees and overgrown bushes and maybe that is what kept it hidden form me for so long. But the more I looked at the building the more I felt something that my mom had always told me, "When God speaks to you, you will know it". And so the rest, as they say, is history. And another series of interesting stories much too involved for this document. But most of all thanks to the building's owner, Buford Jennings and many helping hands, Lynchburg Veterinary Hospital opened in the Fall of 2012. If you have never visited our hospital we invite you to come and see us and experience what we pride ourselves in... as a personal and comfortable animal hospital with state-of-the-art equipment in a home-style atmosphere. If you are a client, we humbly thank you for your patronage and thank you for entrusting us with the lives of your beloved pets. If you ever want to hear some of the other interesting stories or the unique history of this building, we would love to share those with you. Once here, as you move room to room in this neat old house, as we prefer to call it, you will see one constant in most any room you stand in; a cross. Just a gentle reminder to each of us as to who the "ultimate physician" is and the reason we are in Lynchburg today. I grew up in Wisconsin and graduated from the University of Wisconsin-Madison School of Veterinary Medicine in 1991. Bryant and I met while I was doing a senior externship at the mixed animal practice he was working at in Apex, North Carolina. I adored him at first site and the staff there convinced him to take the poor little girl from Wisconsin on a date! We married in 1993 and opened a mixed animal practice in southeastern North Carolina in 1996. A year later, at the tender age of 31, I was diagnosed with breast cancer. I survived surgery, chemotherapy and hormonal therapy but was told I might not be able to have children. In 2002, the Lord blessed us with Bart, and then in 2005, we were doubly blessed with Alex! In an effort to slow down and enjoy life a little more, we sold our busy practice in 2006 and moved to Tennessee to 'retire' and raise horses, cows and a vineyard. We live among the rolling hills of Flat Creek, between Lynchburg and Shelbyville. We have a 'herd' of cats (they have their own house on the farm! 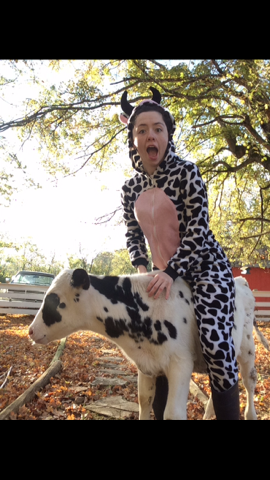 ), 6 dogs, horses, beef cows, a dairy cow named Bessie, chickens, turkeys, pheasants, and peacocks. I thoroughly enjoy spending my mornings tending to the farm animals, my afternoons taking care of clinic business, and my evenings and days off with my family. You can visit our home, Golden Gaits Farm, online by clicking here! It is truly a joy to drive over the hill on Highway 82 every day and enter the hollow to go to 'work'. I love the smell of mash permeating the city some days when I get out of my car in the clinic parking lot. I love the hometown atmosphere and the comraderie of the townspeople and the business owners. 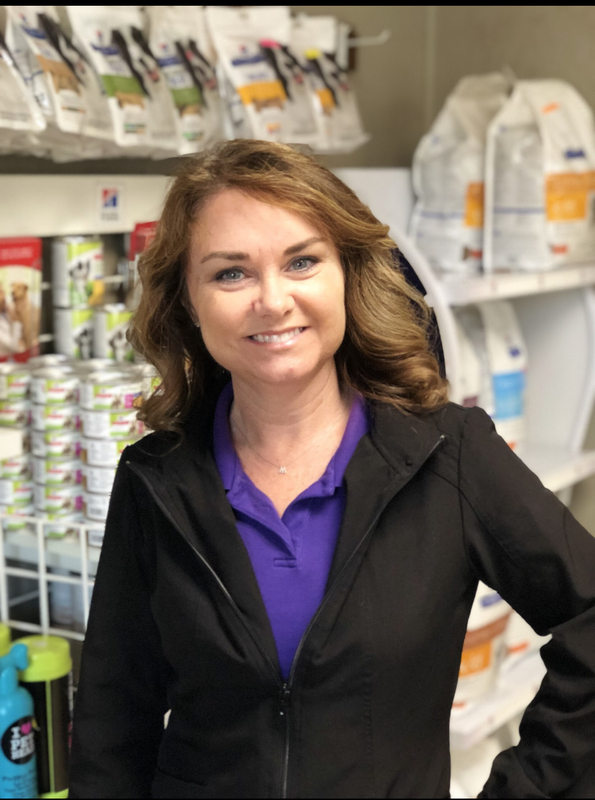 I love our team members and our clients and the many four legged (and sometimes two-legged) patients that come through our doors. I love the historic old building that is our second home. Cancer changes your life. It smacks you upside the head and quickly forces you to put your priorities in order. The real prospect of dying encourages you to really live. I wake up each day wondering if this is the day my cancer returns. Until that day, I vow to make life exactly what I want it to be, and I couldn't be happier in this little corner of Tennessee, doing what I do, surrounded by the people in my life. I am 30 years old and have lived in Lynchburg for 10 years now. I am married to Dale Parks and together we have 4 children: Daniel, Bradley, Joshua and Ashlee. When I am not working I am spending as much time with family as possible, working on health and wellness for me and my family or showing horses. I have been here at Lynchburg Veterinary Hospital for over 4 years now and can't picture myself anywhere else. Note from Wendy- Brittany has been beloved part of the LVH family from very early one. Her patience and steadfastness is admirable! She has excellent technical (and people) skills too and is on her way to becoming a licensed veterinary technician. Brittany has been a great blessing to all of us! Hi, I’m Brandi Harrell. I’m from New Market, Alabama. I have two dogs: Opie and Chibs, a Holstein steer named Eli and a pig: Jax. Growing up, I've always had a passion for helping anything in need, animals included. It brings me joy that I not only get to assist in taking care of animals, but I also get to restore the well-being of their owners. As a pet owner myself, I understand the worry that comes along with a sick pet. I love that every day is a new learning experience and a chance to meet new people and pets. I am very thankful for Doctors Bryant and Wendy Morton to bless me with this wonderful opportunity. I enjoy my days here, and interacting with our clients. 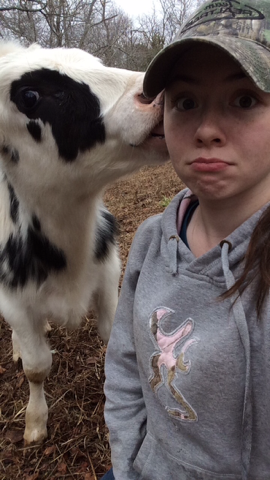 Note from Wendy- Brandi is a bonafide cow lover! She is also a lot of fun, as you can see from the pictures. She came to us when we really needed someone just like her! She drives a long way each day to help the pets of Moore County and she adds sunshine to each day here. 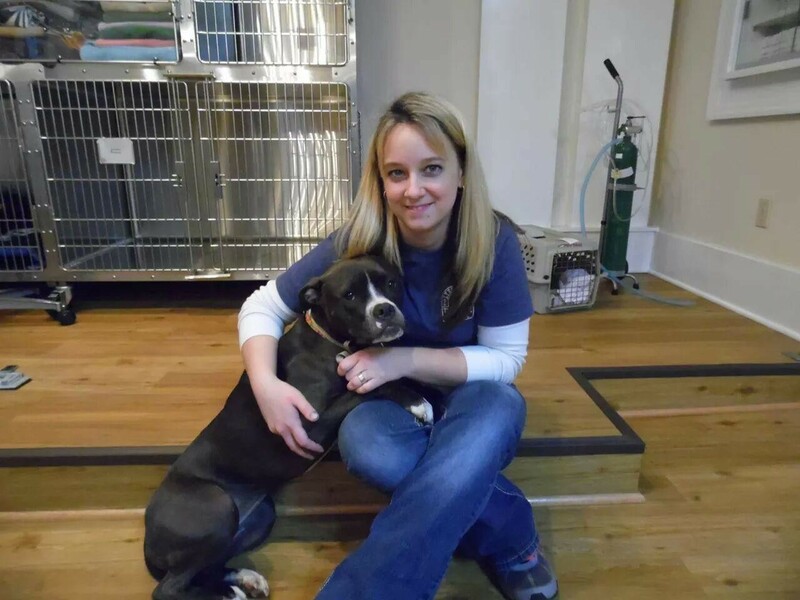 She is also in school to become a licensed veterinary technician. Hi! my name is Karah. 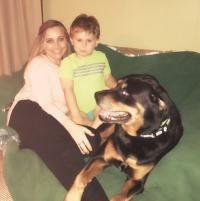 I have two children...my son Liam and our Rottweiler Chaos! I was born and raised in Wisconsin on a cattle ranch. When I was 19, I joined the Army and was stationed at Fort Campbell, Kentucky. In 2013, after serving eight years and three overseas tours, I decided to end my service and stay home with my son. After leaving Fort Campbell, we moved to Lynchburg. I have always loved the small town atmosphere, and Lynchburg has been a great community to raise Liam. I have always had a special love for animals. When I was five years old, I got my first horse, 'Outlaw'. For 22 years we shared a bond like no other. In 2012, I lost him to illness. In 2009, I met and fell in love with my Chaos. He was six weeks old at the time! In October 2010, while deployed to Afghanistan, I received my second purple heart. I sustained injuries and nerve damage to my left arm. The road to recovery was long, and Chaos was by my side every step of the way. I truly believe that animals and their humans share one of the most precious bonds imaginable. I have seen first-hand the therapeutic healing powers these bonds hold between service animals and veterans. I am honored to be part of this community, and for the opportunities the Mortons have given me here at Lynchburg Veterinary Hospital. Hello, my name is Michellie Pope. I grew up in Southeastern North Carolina right next to the beautiful Carolina beaches. I was raised in a wholesome christian home full of love. When I moved from North Carolina to Tennessee, I left behind my two adult children, Zachary (23) and Caleb (21), my parents, step-parents, brother, sister-n-law, niece, nephews, a whole bunch of uncles, aunts, cousins, my sweet granny and I can't leave out my former co-workers and wonderful church family at New Life Church. Life has brought me so many sorts of things, good and bad. At the age of 12, I was in a bad accident that, without the Hand of God, should have left me dead. However, God saw fit to spare my life and brought forth many miracles not only in my life, but my family as well. As I grew, God has done so much in my life. He gave me a talent to sing for Him and a love for people, loving and serving people is my passion. In the few, short years I have been allowed to live here on this ole world, I've been blessed enough to visit many places and meet lots of people. I was given the opportunity to attend college at Fayetteville Technical Community College later in life and graduated with an Associates Degree in Applied Science, becoming a Funeral Licensee but my passion is working and doing just what I'm doing right here with the Mortons' . I am so grateful my Lord has given me the opportunity to move to Lynchburg, TN and work for my dear friends, Dr's Bryant and Wendy Morton. Life just gets better and sweeter as I grow older. Hi, my name is Debra Sample, I was raised in Racine, WI but have been fortunate to call many states my home. My favorite, of course is Tennessee. After being a caterer and event planner most of my life, I've made the decision to semi-retire and care for animals and their people. Working for Dr's Morton is certainly a blessing.